Recycle cartons in your curbside recycling program. Cartons, the packaging for food and beverage products you purchase at the grocery store can be recycled through your community's curbside recycling program. Includes milk, juice, soup and broth plus wine cartons. Cartons should be emptied and rinsed. Replace the cap and place in your curbside recycling. [video] Learn more about recycling cartons. Cartons refer to a type of packaging for food and beverage products you purchase at the grocery store. They are easy to recognize and available in two types—shelf-stable and refrigerated. Shelf-stable cartons, which can be found on shelves in grocery stores, contain juice, milk, soy milk, soup and broth, and wine. 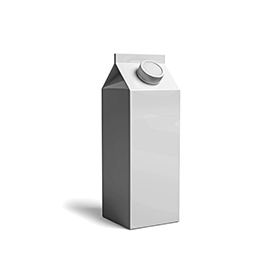 Refrigerated cartons include milk, juice, cream and egg substitutes. These cartons can be found in the chilled sections of grocery stores. Before recycle, empty, rinse and replace the cap. Cartons are mainly made from paper in the form of paperboard, as well as thin layers of polyethylene (plastic) and/or aluminum. Shelf-stable cartons contain on average 74% paper, 22% polyethylene and 4% aluminum. Refrigerated cartons contain about 80% paper and 20% polyethylene. What you may see as wax on a carton is actually a thin layer of polyethylene (plastic). These layers can be peeled apart for recycling -- cartons are not difficult to recycle as long as the right systems are in place to do so. The paper fiber contained in cartons is extremely valuable and useful to make new products. The area of the country you live in (and the local mill) determines what your cartons will become Some mills recycle cartons into tissues, while others use the paper fibers to make office paper. In some cases, they are even being used as one of the materials for wall boards manufacturing. By recycling, your cartons are put back in business as the items you use every day! Visit the Carton Council for more information.